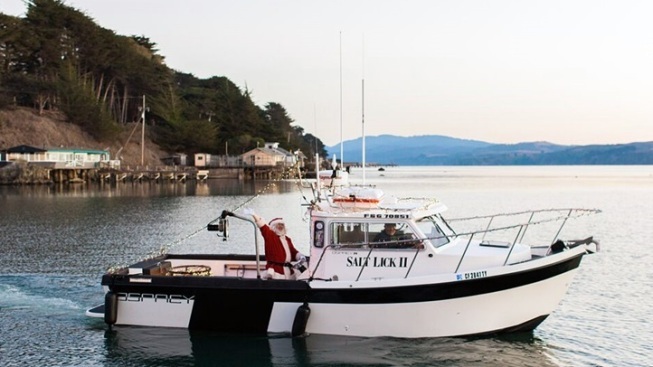 The Jolly Old Elf'll be calling upon Tomales Bay, San Diego, and Capitola, too. Want to see Santa Claus boat up to Nick's Cove? Make for the Tomales Bay location on Sunday, Dec. 2. HE BOARDS A BOAT, or a surfboard, or outrigger canoe, all to make his, yes, splashy entrance. Where to find Mr. Claus is his more oceanic, H2O-wesome guise? Look to one of his traditional by-water, or close-to-water stops, which are just ahead. Those include Nick's Cove Restaurant, Oyster Bar & Cottages in Marshall, on Tomales Bay, where he will toot-toot in by boat on Sunday, Dec. 2. A toy drive (do show with a toy to donate, if you can) and gratis snaps with Santa are part of the joy. But happening even before that? CAPITOLA... will welcome Surfin' Santa in his outrigger canoe on Saturday, Nov. 24. Music, chats with Mr. C (post towel-off, natch), and more merriment shall ensue. And because Santa Claus is renowned for his powers of enchantment and moving about, hither and yon, in a flash, he'll also be at Seaport Village in San Diego on that same day. So surf to the shopping destination on Nov. 24 to see Santa in his board shorts and to grab a pic with him, too. Will he have his super rad surfboard nearby, for photos? Such is Surfin' Santa's vibe. More details are here.